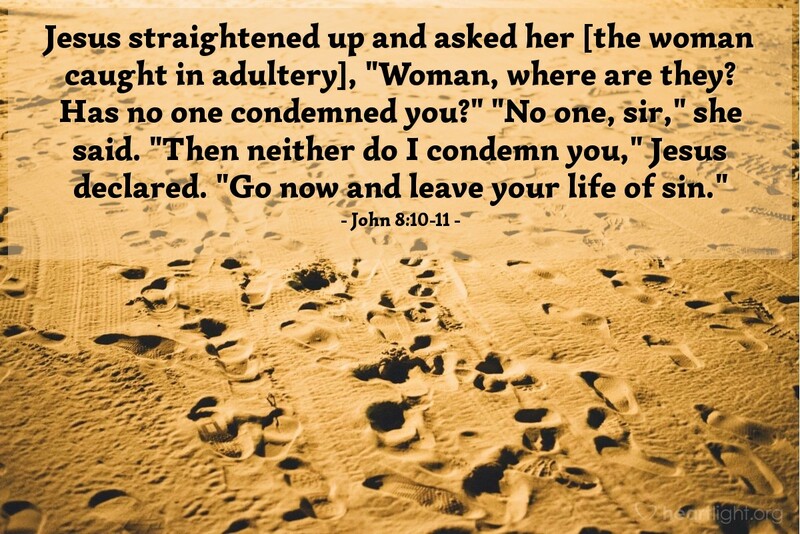 Jesus straightened up and asked her [the woman caught in adultery], "Woman, where are they? Has no one condemned you?" "No one, sir," she said. "Then neither do I condemn you," Jesus declared. "Go now and leave your life of sin." Forgiveness is wonderful if it leads to life change. Jesus came to call us from sin, into his presence, and for his good pleasure. He gave us grace but is also gracious enough to not leave us in sin! O LORD my God, holy in all your ways, please transform my heart and my life into your holy will. Give me the assurance of forgiveness and the courage to leave my sin behind. In Jesus' name I ask you for your gracious and unlimited power to mold my heart and my life into a clearer reflection of you. Amen.